no + politics or What We Want/Glasgow Edition at CCA, Glasgow. Photo: Tatraum Projekte Schmidt. no + politics or What We Want/Glasgow Edition is an immersive piece interrogating ideas about contemporary Europe. While watching this experiment there is a constant reminder of Le Corbusier’s famous principle of ‘a house as a machine for living in’. Six performers, some of whom are British, some of whom are from Tatraum Projekte Scmidt from Dusseldorf, ask what it means to inhabit Europe, the question of shared space, and how we identify ourselves in this fragmented, divisive time of Brexit. They plant ideas in the head of each spectator, as everyone navigates their way around the work space, by simply presenting primary coloured modern buildings, shops and work spaces. The individual spectator may start asking questions, like, is communal living the way forward, or would we be stifled? City living can be alienating, and often enough, we don’t know our neighbours anymore, so what is the alternative? Why is street food so pricey- is it the cachet of so-called ‘authenticity’? In egalitarian monochrome, the performers could be waiting staff, were it not for the glittery tights they all wear underneath. They disarm with a smile, as they crawl underneath tables and with Butoh-like stretches, occupy the windows of the CCA, squirming, making acrobatic shapes, taking up all the space, then piling on top of each other like a kind of human Jenga. Just one slip can send the others tumbling to the ground. Just like Theresa May’s decision? All is insinuated here, all is insidious, implied. Their dance is sleek, slippery and animal. Echo chamber thinking is implied as Miriam Gronau talks to the windows, or bends inwards. At times, it’s like watching Trip Advisor glitching, as cultural stereotypes around superiority, black bread, museums and beer are first deployed, then begin to unravel- words, the mantra of ‘You will lose your head in anger’, spoken in different languages, become so much guttural noise as words become babble, increasingly redundant. The film shown in one space is of crumpled material, waterproofs which fail to protect, collective entropy and tentative hands grabbing (impotently?) at flesh. Liz Strange claws at a window, begging to be let in. 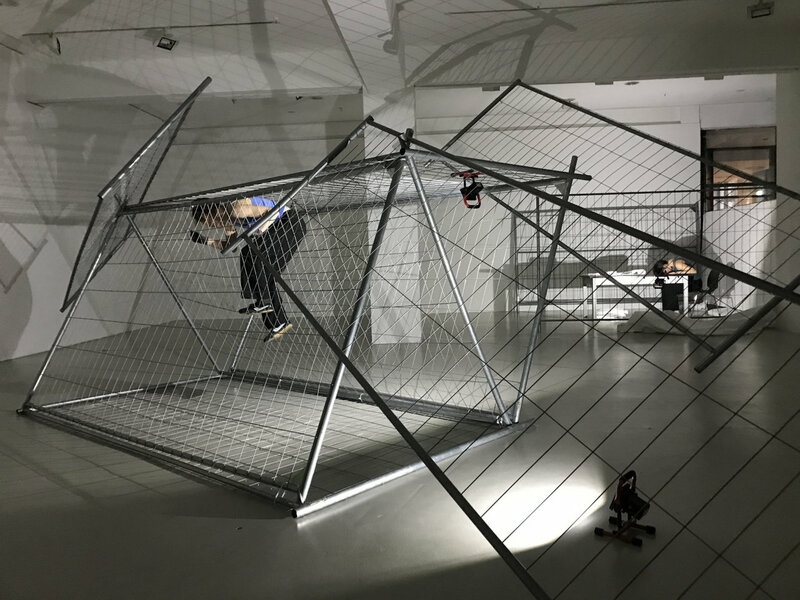 Beth Kovarik and Dylan Read bicker like siblings over Bavarian cliches, and borders are created, in the form of wire constructions, which act as makeshift homes, goalposts or cordoned off spaces. Symbols of that which strengthens and divides, just like the question of Brexit. All is open to a multitude of interpretations, and vacillating between high concept and absurdism. Performers throw each other around, sniff at each other like pack animals, and strut, now divested of workaday shirts and wearing vests the same colour as the model houses in pictures the audience was shown at the start. Ultimately, though, the piece works as a European adult playground, and speaks to the complicated truth: that we are fallible, and somewhat ridiculous – confused children in adult skin. We can relocate, fill our little lives with tech, home comforts and all the empty trappings of consumerism, but we can never escape our selves. no + politics or What We Want/Glasgow Edition was on at the Centre for Contemporary Arts from 17-18 January 2019. More info here.